Maintenance - The Striping Co.
We've seen it time and time again. Parking lot owners are forced to pay for a complete asphalt overhaul due to lack of maintenance. 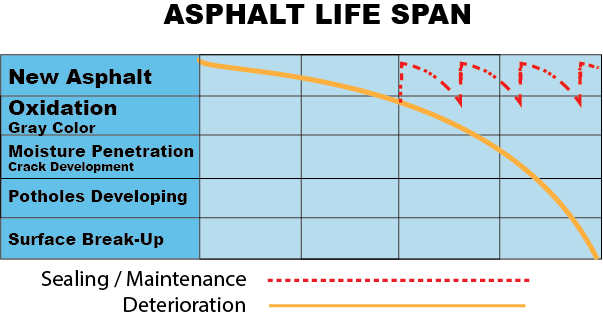 The above chart shows that with a steady maintenance plan, your asphalt can maintain it's integrity while with no maintenance your only recovery option is to replace your asphalt. Replacing asphalt can cost anywhere from 4 - 10 times what you would have paid maintaining it with The Striping Co.